I'm thinking of doing a series on my blog, where every fortnight or month, I haven't quite decided yet, I focus on a brand that I've been loving, whether it's just one product that I've been loving from them or multiple products and why I love the brand and their products, whaddya think? I'll kick start my first one off and you can let me know how I did and if I should do more or scrap the idea, I'm happy with honest feedback, if it's no good, tell me! REN is a brand I've heard so much about but just never really chose to buy any products from, it's not that I've never been intrigued by them, who doesn't want to try their Gycolatic Radiance Renewal Mask? and I Can't say that I've never filled my basket on several websites with their oh so popular products, but I've just never been given the nudge by anything to press that purchase button. Though I think I've finally found the nudge that I needed after receiving these samples recently. 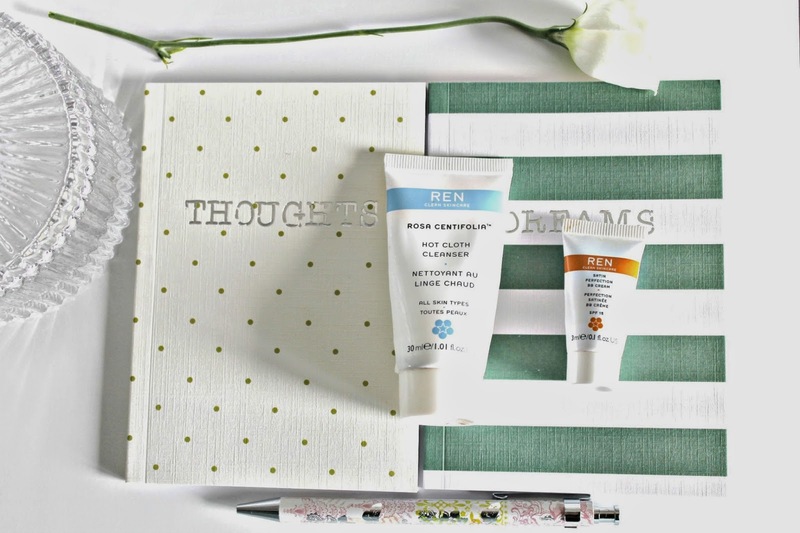 Launched in 2000, Ren's philosophy focuses on 'Clean skincare' using 'groundbreaking product formulation, the latest hi-tech actives, rigorous product testing and clinically proven results.' The brand use 'only 100% plant and mineral derived actives' and they do not test on animals. I received the generous 30ml sample of REN's Rosa Centerfolia Hot Cloth Cleanser £16 along with the perfectly partnered cloth, I didn't photograph this as it no longer looks pretty, you know, unless you think mascara and foundation stains tend to look good, though these do wash out pretty darn well, ok it's just not clean, in last month's Marie Claire magazine. Although I swore I would never replace my Liz Earle Hot Cloth Cleanser, and I still don't think I could replace it, but this is definitely a runner up in the hot cloth cleanser department. I have been using it every night before bed, after pre-cleansing with a micellar water, I massage a five pence sized amount of the cleanser into my face, gently massaging into my eyelashes to remove any traces of eye make-up that may be left, but be warned, getting it in the eye may result in cursing or crying, whichever you prefer, maybe just don't open your eyes before rinsing, I then soak the cloth under warm water, rinse out the excess water and remove the makeup, rinsing the cloth in between sweeps to remove makeup from the cloth and avoid spreading bacteria across the face. This cleanser not only makes your face smell uh-mazing but it leaves your skin baby soft, smooth and calm too. I noticed for the duration that I used this product, my spots were kept at bay and my skin wasn't left feeling tight but actually quite hydrated. At just £16 I can see myself repurchasing this soon enough. I was lucky enough to get my hands on the BBBBox last month, if you didn't see it, you can see my post here. This box included a tiny 3ml sample of REN's Satin Perfection BB Cream, which surprisingly gave me a few applications, I was expecting one, it smells so good too! This is a silicone free BB cream, which I was surprised to discover as it feels so silky smooth that I assumed it was silicone based, it glides over skin like a dream and gently dabbed in with a make-up sponge leaves a flawless base. I found this BB cream was buildable, at first it's quite a light coverage but I found it covered my blemishes if I gently went over those areas with a little more product. Although this looks quite orange, scary upon first touch if your pale like me, when blended it almost seems to adapt to your skin tone. The SPF 15 ensures that your skin is protected from environmental factors whilst the bio extracts allow your skin antioxidant protection. I already want more! What do you think about REN? Have you tried any of their products? How'd I do with the post? Go on, tell me the truth, I'll love ya for it!